The developers behind Chillingo's Madcoaster talk DLC, the new iPad and...Chewbacca? We have to give the developers at CGMatic credit for trying something new. Faced with a competitive running genre filled with notable hits, including Canabalt, the team partnered with Chillingo to put a new spin on the popular formula, exchanging escaped convicts and guys with plasma swords for, of all things, a roller coaster. In Madcoaster, players guide a five-car scream machine across broken tracks and through loops to see how far they can travel. Suffice to say, we loved it. With this in mind, we fired off some questions to the team concerning downloadable content, Chewbacca and even the new iPad. On top of that, you can download Madcoaster by clicking here. 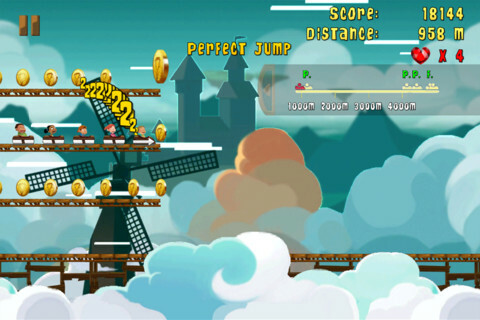 OK, a roller coaster based platform game...how did you come up with that idea? Well, we love roller coasters, and one of the concerns we always have when we ride the roller coaster is whether it's safe or not. So, a roller coaster game with crazy and disconnected tracks came to mind. The endless runner genre started to pick up when we first started developing this game, so we felt it was the target genre we should aim for, so here it is, Madcoaster. We noticed players can purchase more environments. Why go with an in-app purchase instead of making all the levels available from the beginning? Do you know if people have paid the extra dollar? We felt that we should reward people when they reached a certain distance (10000m) with something interesting, so we thought new themes were a good idea. However, we also want players to be able to access the new themes without having to reach 10000m, so we decided to make it an IAP [in-app purchase]. Do you have any DLC plans for this game? Yes, the next update will feature many items for players to enjoy. They will be able to use the coins they collect to buy them. The gorillas sound like Chewbacca when hit. Was that intentional? No, it wasn't intentional. We did not think the gorillas sounded like Chewbacca when we developed the game. How many people worked on this title, and where are you based? There are four main team members working on this project and a few other members who helped with programming and adding graphics here and there. We are based in Bangkok, Thailand. What do you think of the new iPad, and will you update the game to take advantage of the retina display? Well, we do not have our hands on it yet, as it's still not available here in Thailand. However, we think it's awesome, and look forward to playing with it. The binary size for graphics will definitely take up more space, so when we develop more content, we'll have to keep that in mind and explore how we get our games to fit in that size limit. The new features and processor capability are really driving handheld gaming forward, and we're happy to be a part of this exciting time.